High blood pressure, also called hypertension, is a medical condition that can lead to serious consequences if left untreated. It is a chronic disorder, featured by raised blood pressure levels. Many people with high blood pressure, are not aware of it, due to not having any obvious symptoms. However, if blood pressure is notably elevated it can cause dizziness, headache, nausea and vomiting therefore, blood pressure needs to be checked regularly, at least once every two years. 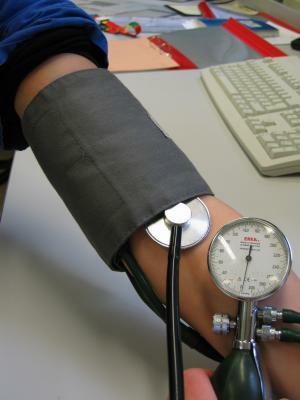 High blood pressure commonly develops over years. Uncontrolled high blood pressure can damage organs and increase the risk of severe conditions such as stroke, heart disease, kidney failure, aneurysm and eye damage. Damage to the brain frequently occurs as a result of complication of high blood pressure. The reason is insufficient supply of oxygen-rich blood to the organ. Compromised blood flow to the brain consequently increases the risk of severe conditions. One of them is transient ischemic attack (TIA), also known as ministroke. It occurs when blood flow to the brain temporarily stops and causes short-term neurologic dysfunction. If the condition continues over 24 hours, it is considered a stroke. Stroke is another complication of high blood pressure in which blood cells of the brain die because the organ is deprived of oxygen supply. Next complication of hypertension is aneurysm which is an abnormal widening of blood vessel that can rupture. High blood pressure can also cause dementia, which is a loss of brain function and it impairs memory, thinking, speaking and other mental skills. High blood pressure damages the heart and kidneys and increases the risk of different complications related to this organs. The heart suffers when blood pressure is high because it puts the organ under a strain and weakens it. This can lead to heart attack, particularly if sufferer has coronary artery disease or atherosclerosis. Other complications related to heart are enlarged left heart, heart failure and cardiac arrest. High blood pressure can cause an aneurysm in the kidney arteries that can lead to severe internal bleeding if it bursts. Hypertension can also cause kidney scarring that increases the risk of kidney failure. Kidney failure is a loss of kidney function that occurs due to damage to the large arteries leading to the kidneys as a result of high blood pressure. High blood pressure can also damage blood vessels that supply eyes with blood. This condition is called retinopathy and may lead to blurred vision and vision loss. High blood pressure can cause choroidopathy, which occurs when fluid builds up under the retina. It also affects vision. Finally, high blood pressure can result in optic neuropathy, damage to eye nerves, which can lead to total loss of vision.